Senior swimmer Julia Wilson of Kenyon earned top honors for the 2017-18 Google Cloud Academic All-America Division III At-Large Team, as selected by the College Sports Information Directors of America (CoSIDA). 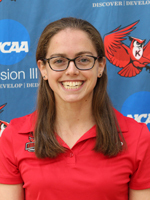 A breaststroke specialist, Wilson was a four-time NCAA Championship qualifier and won her first national title this past season as a part of the Ladies’ 400-meter medley relay team. She earned All-America honors in all five events she swam in at this year’s championship meet, which brought her career total to 16 for her career. Of the 45 student-athletes of each gender selected to the Division III Academic All-America® At-Large teams, 13 men and 17 women were swimmers. CoSIDA contributed to this report.